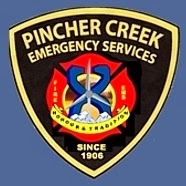 Toni Lucas - Pincher Creek Emergency Services was called to a field fire approximately two kilometres south of town east of Highway 6 on Thursday, August 24 at approximately 4:30 pm. The fire appears to have started due to equipment/mechanical reasons. Deputy Fire Chief Pat Neumann said the fire was extremely small, was doused quickly, and there were no injuries . "The farmers are prepared, and have equipment to deal with emergencies like that." Deputy Chief Neumann urged continued caution. "We have extremely dry conditions, please take the best care you can." He mentioned the high risk time of the day is when the relative humidity is at its lowest, often between 2:00 pm to 7:00 pm. "That is our high risk area." There have been a higher than average number of agricultural fires this summer, according to PCES Chief Dave Cox. A Fire Ban is still in effect for most of southern Alberta.